As I get older I find myself forgetting things that I really should remember and remembering details that I wish would simply clear from my brain’s cache to make room for more useful data. I can still recall the phone number from my childhood home, yet remembering the unique PIN number my cable provider wants me to give them before I talk to a human working there is well beyond my grasp, even a day after I make one up. Life is complicated enough without someone else badgering me for yet another new security PIN or password, each with it’s own unique set of requirements. 6 characters? How about 8-14? Must have a non-alpha character, must not. Can’t be longer than 8 characters. Case sensitive. Must be mixed case. Enough already! I manage an increasingly large portion of my life online or on the phone so this is a big deal. What’s a person to do? There are a couple of no-cost solutions. Some people use the same password for everything. You come up with some nice, safe password like "ih82f0rg3tp@ssw0rd$" and use it all over. Sure, it’s safe from dictionary attacks but what happens when your password is stored in plain text on some server you access and their database gets hacked? Bye-bye digital identity. You can also try to remember passwords using something like a post-it note. Simply write down your passwords on a large yellow post-it note and attach it to your monitor for easy access. This very popular method is employed by many non-technical people and works great until someone with extraordinary hacking skills breaks down your security. Hacking requirement: someone with the ability to read post-it notes. My Mac Solution When I switched to Mac one of the applications I got several recommendations for was 1Password. It quickly became one of my must have utilities, installing seamlessly into my browsers and making the process of remembering usernames and passwords a no-brainer. What I love is that since I tend to bounce between Safari and Firefox it will maintain my password information on both machines. It will also fill out forms for me, including things like credit card details. For the US $35 price it’s one of the better purchases I’ve made for my Macs. Highly recommended. When I finally got my iPhone one of the applications I couldn’t wait to see on it was 1Password. Though my Safari bookmarks were able to sync up with my iPhone, none of my login information did. Suddenly I found myself without my key usernames and passwords and was struggling to remember the information 1Password made it so easy for me to forget. With this frustration in mind I downloaded 1Password from the App Store and set it up. Price: Free! On the bright side the master password is only asked once per session. 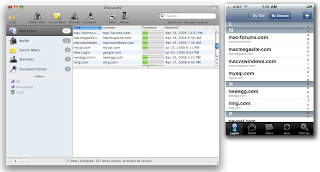 Syncing up a 1Password installation on a Mac and an iPhone is really simple, though it does require a wireless network connection (not 3G or Edge) on the same network as your Mac. At least it doesn’t require a .Mac MobileMe account. First off, make sure you have the latest version of 1Password installed on your Mac. Launch 1Password and select Sync to iPhone… from the Sync menu: From the iPhone you click on the Sync button at the bottom and you will be presented with a code that must be entered into your Mac so that they can be matched up. Once that’s done you can select your Mac from 1Password on the iPhone: Click the big blue Sync button and off you go. Now your iPhone will have the same data as your Mac’s copy of 1Password: Daily iPhone Use – Not Quite There Though I like 1Password for the iPhone and love that it now has all my passwords safely stored away, the integration is not nearly as smooth as it is for the Mac version. I cannot access my password information from Safari. Instead I need to go to 1Password, enter my digital code, select the site I want to visit, enter my master password and then I can access the site. Rather than push me to Safari, 1Password uses it’s own browser, which can help enter login information. Note the small keyhole icon at the bottom. Clicking that will allow you to push in your login credentials for the site. In practice it’s a mini version of Safari, though from within it you do not have access to your bookmarks or Safari history. While it does allow you to use the zoom features, the browser does not automatically go into Landscape mode when the iPhone is oriented sideways. Perhaps the most frustrating part is that if I leave 1Password to grab some other information and then return to it, I am not brought back to the page I left. Instead, I need to go through those steps again. The happy medium I’ve found is that I use 1Password to help me remember the passwords and then simply access the sites through the Safari browser. This is where a copy and paste feature would be incredibly handy. In effect I use 1Password on my iPhone as a digital, password protected post-it note. Still, the price cannot be beat and at least I can look up those passwords and user names without having to remember them.